Ciao from Hannah & Meg! This week, we’re extending a very warm welcome to our buddy and fellow Syracuse MA grad, Emily. We thought to ourselves, “Is our blog starting to look more Renaissance Fair than city explorer?” So Emily swooped in to save the day and offer some insights on one of Florence’s more recent architectural additions. Take it away, Em! Brunelleschi, Arnolfo di Cambio, Michelozzo, Michelangelo. Tuscany has produced some of the biggest names in architecture, but let’s be honest–visitors tend to flock to the buildings built before the 20th century. Now, I’m a huge fan of history, and I love old buildings. But sometimes the focus on the Renaissance history of Florence inadvertently puts blinders on people (myself included), and they miss out on some great modern structures, like the architecture of Giovanni Michelucci. Never heard of him? Give yourself some credit! If you’ve traveled to Florence, chances are you’re already familiar with his work even if you’re not familiar with his name. In fact, I bet a lot of you have walked through (or over) some of his creations. Michelucci was part of the team that brought you Stazione Santa Maria Novella, a building that manages to be modern and rational while fitting into a historic city. Michelucci also brought us Ponte alle Grazie–a sleek, modern counterpart to the historical Ponte Vecchio. It’s no surprise that Michelucci was drawn to architecture and design. He was born in Pistoia in 1891 into an artistic family that owned their own workshop. He graduated from the Higher Institute of Architecture at Florence’s Academy of Fine Arts and spent time in Rome, where he made many important connections, not the least of which was meeting his future wife Eloisa Pacini. Pacini, herself a painter and poet, was extremely involved in the intellectual culture of the era. As an architect and urban planner active in the post-war era (both WWI and WWII–Michelucci’s life spanned an entire century), Michelucci was full of innovative ideas for the space in Florence’s city center. But today we’re going out of the hustle and bustle of Florence’s Renaissance heart to visit a church that looks a little different than the Duomo–San Giovanni Battista. Also called San Giovanni dell’Autostrada or the Chiesa dell’Autostrada del’Sole, this unique church is located on the A11 highway halfway between Rome and Milan, just past the Firenze Nord exit. It’s a bit of an adventure to get there, but that’s half the fun, right? The church is open Monday-Saturday from 9 a.m. until 4:30 p.m., and Sunday from 9 a.m.-1 p.m. and 3:30 p.m.-6:30 p.m., so plan accordingly. Make sure you’re wearing comfortable shoes and grab the Linea CF bus at the Fiume 3 stop on Via Fiume (it’s just off Via Nazionale, really close to Stazione Santa Maria Novella). Stay on this bus for about half an hour, but be sure you hit the fermata prenotata button in time to get off at the Paolieri SN stop! Once you get off, backtrack a little southeast down Viale Primaldo Paolieri. Keep an eye out for traffic while walking, as these roads aren’t used to pedestrians. When you get to the roundabout, turn left onto Via Salvator Allende. Stay on this road for about a kilometer, then you’ll hit another roundabout. Take the first branch off on your right onto Via Limite. Walk down Via Limite, and the church will be on your right – you’ll know it when you see it! Built between 1960-1963, San Giovanni dell’Autostrada was intended to commemorate the workers who died while constructing the highway. The building also acts as a sort of spiritual rest stop. Located at the halfway point between Rome and Milan, road-weary travelers driving along the A11 can pull over and recharge before getting back behind the wheel. 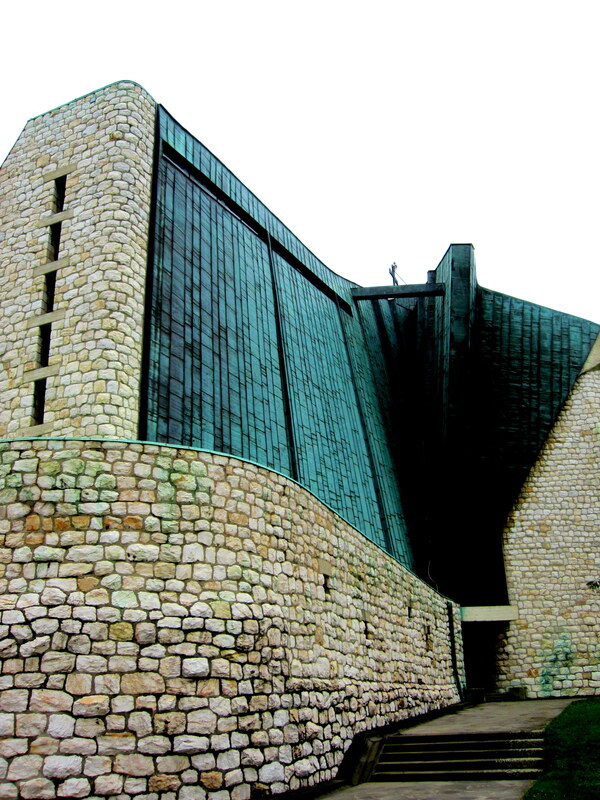 Michelucci himself saw the church as a metaphor for the meeting of different cultures and wanted the architecture to echo the way people met and interacted in the streets. He also wanted the church to serve as a functional gathering point. By the time Michelucci began work on the church in the 1960s, he was well along in his career and had drifted away from the architectural language of strict rationality evident in his earlier work on Stazione Santa Maria Novella. Instead, he envisioned architecture that moved beyond rationalism and broke away from what he felt was an elitist adherence to the boundaries of style and language. 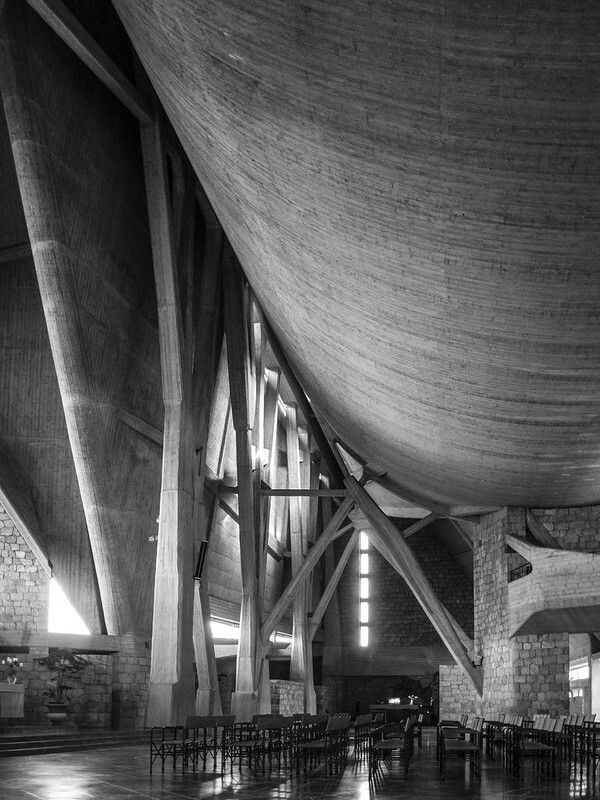 Michelucci believed that architecture should create a permeable space that’s accessible and meets the needs of the community, and it was this philosophy that drove his design of San Giovanni. So, now that we’ve touched on Michelucci and his philosophy (and trust me, this barely skims the surface of Michelucci and his post-war ideas), let’s get to the building itself! Since you’ve sat through the bus ride and mini-hike to get here, why not take a lap around the exterior on the stone walkway that surrounds the church. Notice how every side of the building presents a totally different view? The building’s sweeping curves give the structure an organic feel and a dynamism that earlier Rationalist-Fascist architecture–like Stazione Santa Maria Novella– didn’t value. The roof is meant to evoke a giant tent under which parishioners and travelers could gather. The undulation of the roof is reflected in the exterior walls, where the curves of the surface are violently broken by sharp edges. Michelucci also highlights this idea of rupture and change in the material, where he freely mixes the natural with the manufactured. Once you’ve feasted your eyes on the exterior, head inside. The main entrance boasts two impressive bronze doors. When the church is open, the bronze doors slide apart to reveal a much easier-to-open set of glass doors. Inside, you’ll be greeted by giant bronze relief panels that depict the patron saints of the cities that the autostrada passes by. Continue down this hallway and take a right into the main area of the church. The building seems to open up in front of you. The branch-like concrete pillars jutting from the wall to the ceiling and the smooth stone floor below you give the impression that you’re standing in a concrete forest. Again, Michelucci is mixing manufactured materials with natural ones, and even the concrete is worked to resemble wood panels. The ceiling, which looks tent-like from the outside, now gives off the impression of a billowing sail and brings the eye upward. Okay. Take a look around. Can you figure out the floor plan? Believe it or not, the plan is one of the more traditional characteristics of the church. 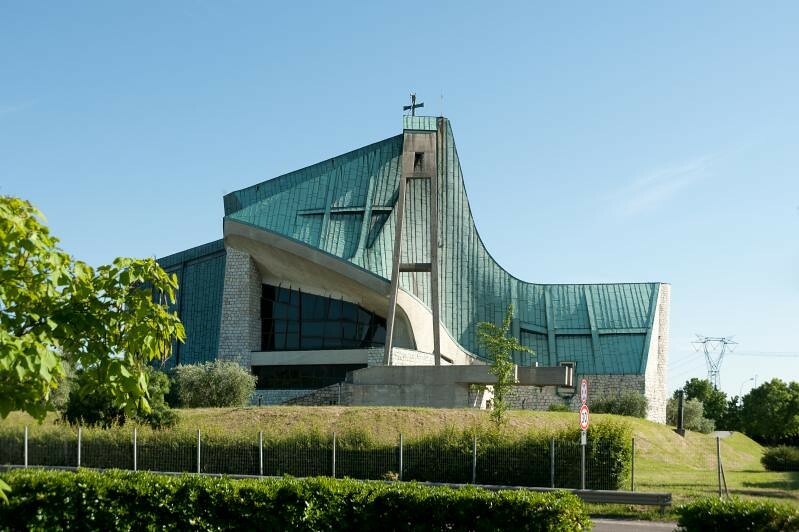 Like the Duomo, the Autostrada church is built on a Latin cross plan–one long arm crossed by a smaller one, with an apse in the back. However, Michelucci took the Latin cross layout and turned it on its side! Instead of a vertically long nave, the congregation is spread out horizontally, with the main altar set up in one of the transepts. Because of this, the congregation is much closer to the altar and the space is much more intimate. Take your time to poke around the church, and if you can, make your way to the baptistery. Like many churches in Italy, the baptistery is a separate structure, but still integrated into the complex. You’ll discover a lot of hidden paths and secluded nooks and crannies that add to that feeling that the church is just a little bit…alive. Like the many road warriors who pulled off the highway when they spied the church, you’ll surely feel rejuvenated and ready for the trek back to the city. And hopefully, when you get back to Florence, your eye will be less tempted to slide over the modern buildings in search of the oldest palazzo! Hey guys! I wrote a guest post for my friends at Florence For Free – check it out! I loved this one guys, I think that ‘modern florence’ could be a great idea for new series by Florence For Free ;-). I always drive by Chiesa dell’Autostrada del Sole on the way to Gigli shopping and its appearance always sort of stops you in it’s track, how nice that you guys covered this. Thanks for reading, I’m glad you liked it! This church really struck me when I visited it, so it was great to be able to write about it – hopefully it will get a few more visitors! Thanks @florenceforfree for this article! This is a very special place for me and my family. The cross upon the church was placed by my grandpa, who is now one of the very few living masons who took part to the construction. Even if he is 93, he keeps on telling stories about how modest was Architect Michelucci and how passionate was this little wise man to coordinate all carpenters coming from any part of Italy after world war II. You should consider that most of them neither spoke correct Italian but only their local dialects: they had just attended a few years of elementary school and had no idea about the overall project. They offered their skills with semplicity to “sbozzare” (shape by hand!) every single rock that covers the concrete and followed the instructions of Giovani Michelucci on the spot. His magic was the fact that he could relate with extreme semplicity directly with the masons, encouraging them to face the stones with own talent and personality. That’s why if you look at the stones from a close distance, they all have a different shape and depth in the edges. It’s fascinating to think about the echo of those chisels and hammers, recalling the efforts of artists of the past and many unknown humble men who gave large part of their lives to build churches and palaces in Florence. Grazie Emily, Hannah & Meg, you should come and visit us in Sesto Fiorentino to visit grandpa Terzilio! He would be honored to get to know you and I am sure he will communicate well with you despite he does not speak a word of English! Thanks for reading the post and for your comment! This church really stood out to me as something special when I first visited it. Your grandfather must be very proud of his work on the church. It’s fascinating hearing about his account of working with Michelucci! I’d love to hear more of his stories – I’ll be sure to get in touch before the next time I go to Florence! Thanks again for sharing!